In the previous lesson, we discussed four very important beginner chords. Before that, we took a look at the C major chord and we discussed how to read chord charts and how to properly articulate and play chords. At this point, you have all the information you need to learn how to properly play a wide variety of chords. In fact you can play every chord that exists. All you have to do is determine what chords you'd like to learn how to play, find a chord chart for that particular chord, and play the chord. Below is a useful tool that you may use to find an enormous variety of chords. Bookmark this page, call it 'chord charts' and reference it any time you wish to learn a new chord. Then all you need to do is practice practice practice. Special thanks to Howard Knight for creating this amazing widget! You now should have all the tools and information you need to learn to play guitar chords. Once you are familiar with playing chords and comfortable with a wide variety of chords (it may take a couple of weeks or months depending on how much you practice), be sure to check out our lessons on guitar scales as well. Once you have mastered all nine chords you will be able to play hundreds of thousands of songs as these are the songs most commonly played in all songs. There truly is no better way to learn the essential guitar chords. If you don't want to give yourself a headache trying to read chord charts backwards on computer screens, this is definitely the way to go. 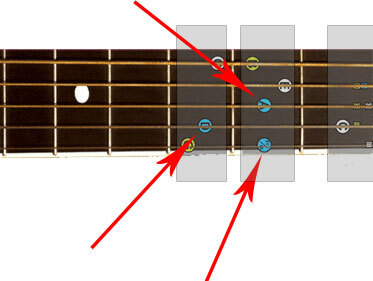 The Basic Chords sticker set allows you to put the chord charts right on your guitar in seconds. To purchase the Basic Chords sticker set, go to the products page. 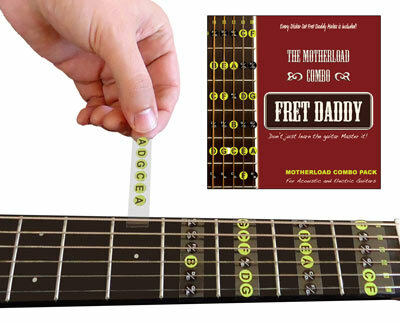 Introducing the Fret Daddy Motherload. Everything you need to learn guitar.